On the morning of Tuesday, October 13, 2015, we got up, had breakfast, and checked out of the Rimba Ecolodge. This was the day our tour of Tanjung Puting was going to start. 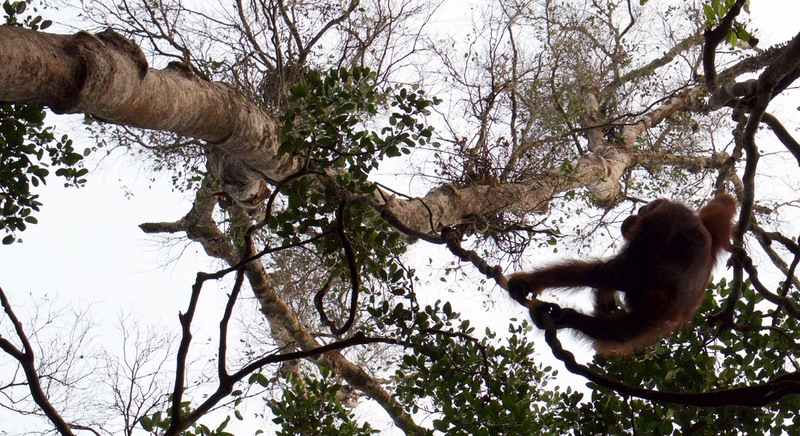 Tanjung Puting is one of two places where orangutans still survive in the wild. They’re terribly endangered, due to their long lives, slow reproduction rate, and destruction of their habitat by humans. 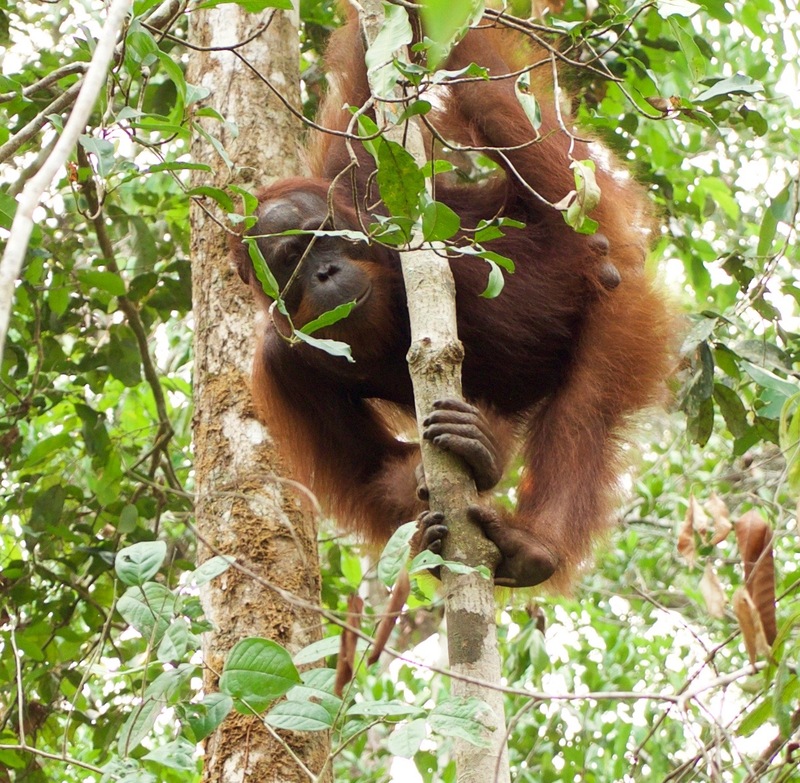 In fact, one of the main reasons for us visiting Indonesia at all was to see orangutans before it’s too late. The common way to do that in Kalimantan is to hire a river boat to take you up the Sekonyer River from the port town of Kumai. The river borders the national park, which has no access by ground or air. These river boats, called klotoks, stop at a few set places along the river, and the tourists disembark to walk to see the orangutans, mainly at feeding stations the park rangers manage. 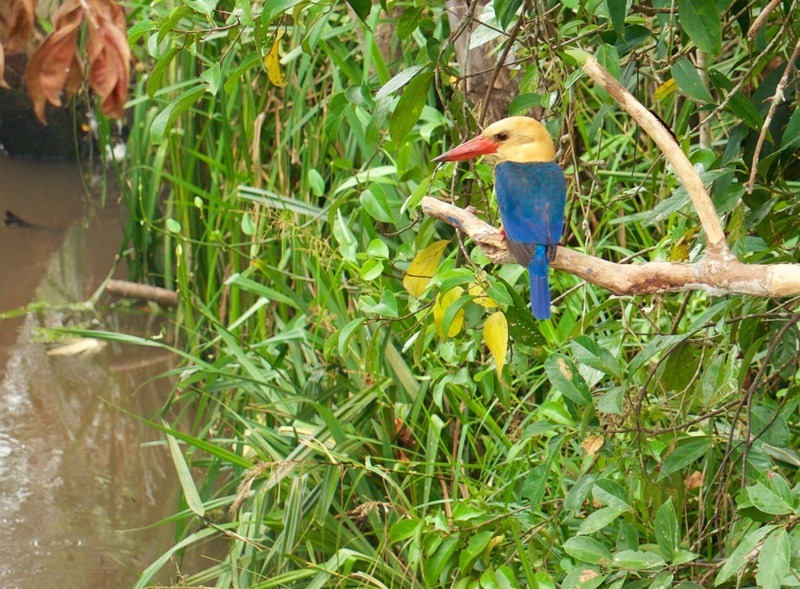 But you can also see the orangutans from the river sometimes, or while hiking around. 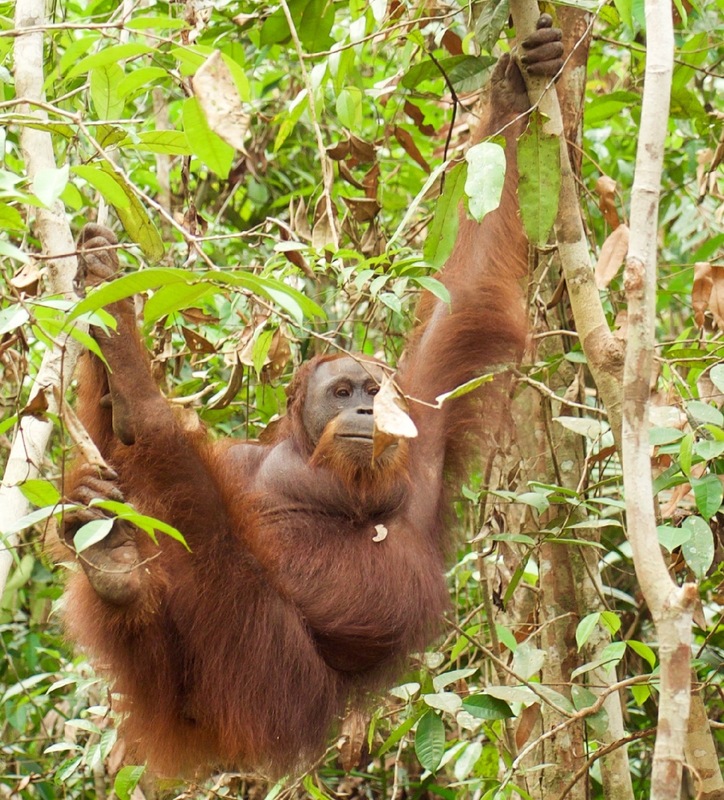 In addition to the famous orangutans, Tanjung Puting has several species of monkeys, lots of wild birds, and a few interesting mammals. Plus crocodiles, tarantulas, etc. It’s only a few degrees south of the equator, so there aren’t seasons like we have in America. The seasons are “wet” and “dry”. We arrived in the area during the dry season, just when the wet season should be starting (though it is late this year). We’d met Adi the day before, and he said he was going to pick us up in the klotok at 11:00 am. So we got our bags ready and checked out, but there was no boat at 11. About a half hour later, a boat came chugging upstream, with a tour guide on the front. He shouted to us from the boat: “Sorry!” And he put his hands together and bowed a few times. His name was Robby, we soon learned. He would be our guide for the trip. Not Siti, the woman who owns the company that I’d been arranging things with for the past few months. And not Adi, the guy who escorted us on the speedboat to Rimba the day before. We wondered for a bit if this was some sort of elaborate scam, but it wasn’t. We climbed aboard, and they brought our bags, and we were soon underway. Not long before leaving Rimba, lunch was served, the first of many hot meals prepared by the dedicated cook. You see, when we signed up for the three day, two night boat tour, we got a boat, a captain, a certified guide, a captain’s mate, and a cook. All just for us. Sounds fancy, eh? The boat was called the Nepartiti, Robby told us. “Named after the famous queen?” I asked. But Robby didn’t know the source of the name. 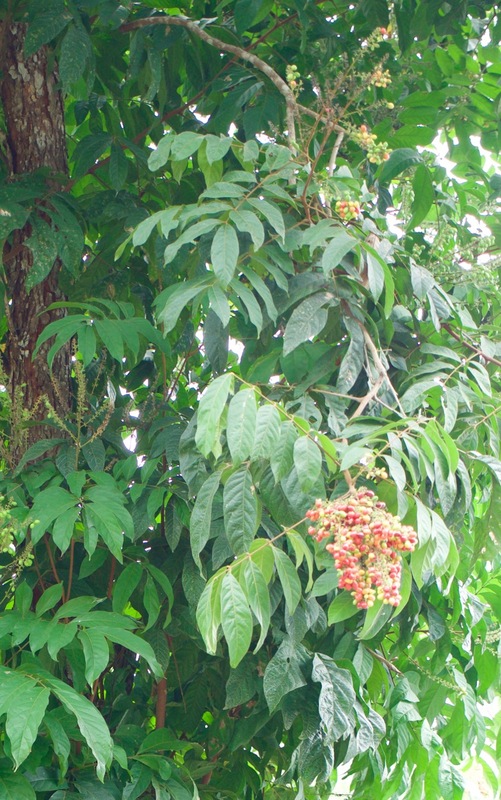 That afternoon we visited a place where they’re growing trees that the locals traditionally used for medical remedies, the first of two “endemic medicine groves”. 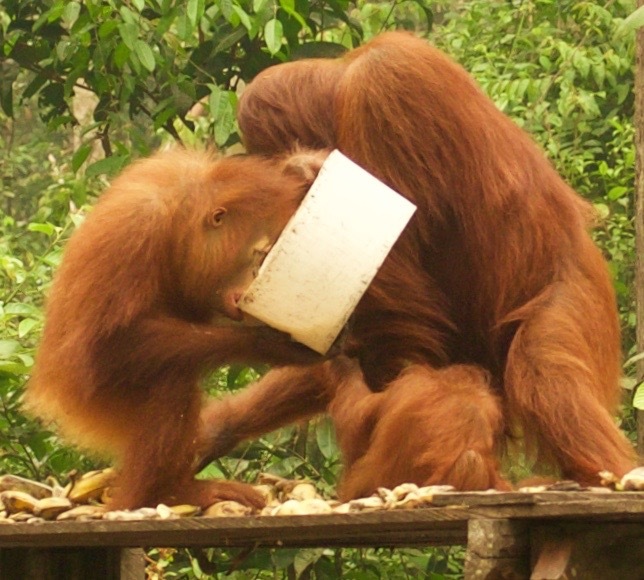 And then we went to our first orangutan feeding station. We got there before the official afternoon feeding time, which was nice. 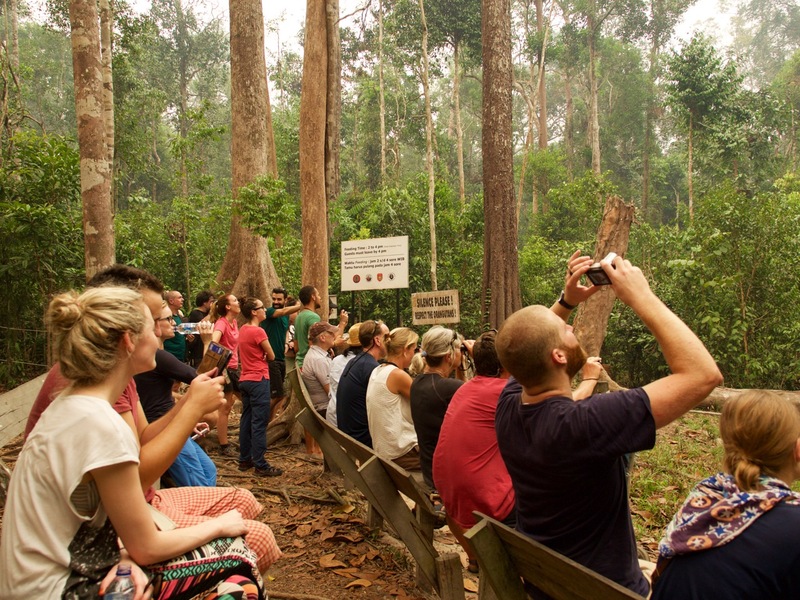 We were the first people to arrive, and got to watch as the orangutans slowly gathered from every direction. They know when it’s getting close to 3:00 pm. The ranger showed up on time, and put out a big bunch of bananas and a bowl of some sort of liquid that we heard from Robby contains vitamins that the orangutans otherwise need. We learned they don’t really naturally eat bananas, but they’re cheap, so that’s what the rangers feed them. 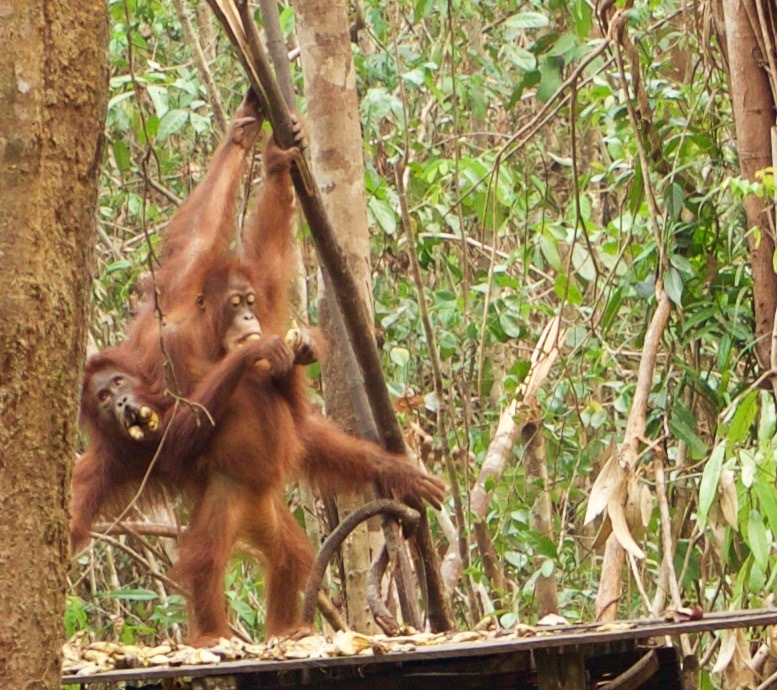 There was a mother and her child, the dominant male of the area, and some other orangutans. Plus we saw a black collared giant squirrel and some other monkeys that afternoon. The dominant male of the area. This guy was BIG! That night, we had dinner on the boat by candlelight. It sounds romantic, but since it was after dark (it gets dark around 6pm), the candles just attracted swarms of bugs that wanted to fly into our food. Beth waved her arms around to try to get the bugs to go away, but it was pointless given the size of the swarm. After dinner, though, the crew set up a mosquito net over our bed on the top deck of the boat, and inside it was quite pleasant. That night, the temperature eventually dropped to the point where we needed a comforter on top of us to keep us warm. I woke up a few times throughout the night with stomach pains, but eventually got a little sleep. Then I was awaked by water dripping. The humid air condensed on the awning over the top of the boat, and started dripping and splashing onto us in the morning. 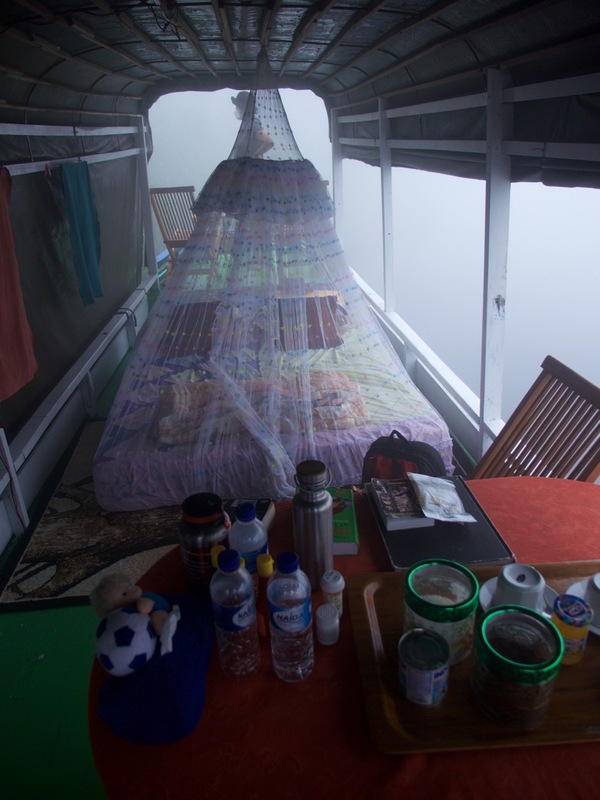 Here’s the top deck of our klotok, with the mosquito net still up and the awning on one side. You can see how difficult it would be to spot birds given the smoke this morning. Our goal had been to do some bird watching at first light. But it was immediately clear that was impossible. The haze was so thick we couldn’t even see the other side of the river, much less spot birds. 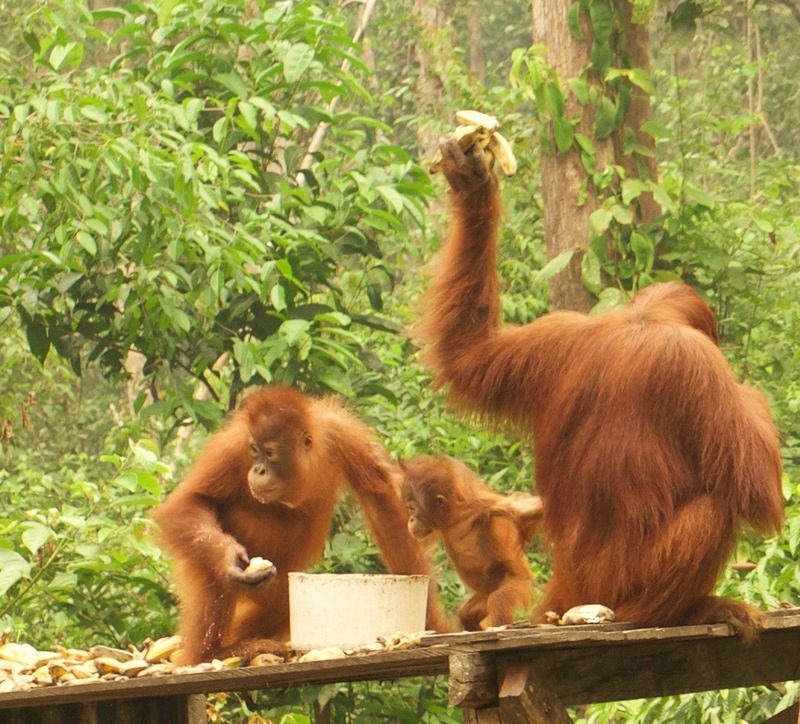 So we eventually cruised slowly up the hazy river to the first orangutan feeding area established in 1971. There we saw orangutans, a gibbon, a pitcher plant, and a visitor center. And we visited one or two other places that day, doing side hikes of an hour or two each time. I’m just chilling out here between these two trees. Who needs a hammock? The park ranger at one of those stops was a blind guy who has been there for 17 years, Robby said. 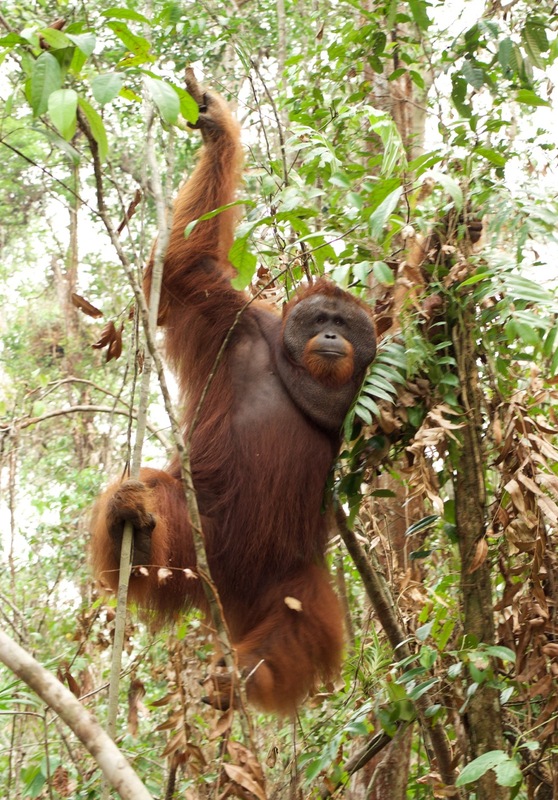 He told us that sometimes when he’s walking, the orangutans will take him by the arm and lead him along. At some of the stops, the river got pretty crowded with klotoks. It was like a tourist traffic jam. That night after dinner we took a long bird walk after dark with flashlights. We saw almost no birds, but we did see a tarantula, a civet, and fire ants. The ants were very big and scared Robby the guide and Eddy the captain’s mate, since they didn’t have full shoes. Robby, like most Indonesians, wore sandals. And Eddy just went barefoot everywhere. We slept better that night, partly because we were more used to sleeping on the boat and partly because my digestive problems had mostly cleared up. The next day was our final day on the river. We woke up to better visibility, and did an early morning bird walk before breakfast. Along the way, we met a guy who lives in the jungle doing his own self-directed reforestation project to plant trees where the forest had burned years ago. He raises hundreds of seedlings, and then replants them where they’re needed. The way of funding his work is that people sponsor a tree. So Beth and I bought a seedling from him. After a very long and drawn out process of deciding just what species of tree to choose, Beth wrote our names and the date on a little sign. The guy dug a hole, and Beth planted the seedling, then the guy pounded the little sign into the ground next to it. If all goes well, this tree will live longer than anyone we ever meet. 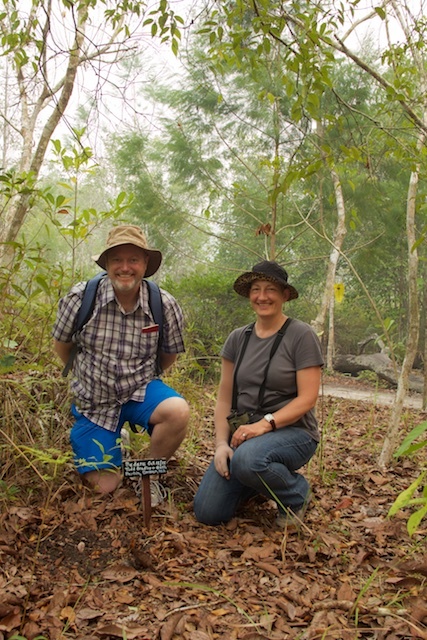 Beth and Todd next to our bedaru seedling at Pondok Kerja. Photo by Beth Partin. We were a bit late getting back to the boat, and the crew were anxious to leave. So we settled in for the long journey back to Kumai. Earlier in the trip, the propeller got broken or bent or something, so our top speed – which wasn’t much to begin with – was even lower. Every boat on the river passed us as we lumbered our way back to base. Hours later, we finally made it. We tipped the captain, tipped the cook, and then loaded up our bags in a taxi to go find a hotel. Robby helped us find one, I looked over three of the rooms, and chose the one priced in the middle. We were so hot, dirty, and tired that anything would do. So we tipped Robby and he went on his way as we settled into our room and enjoyed cold showers. 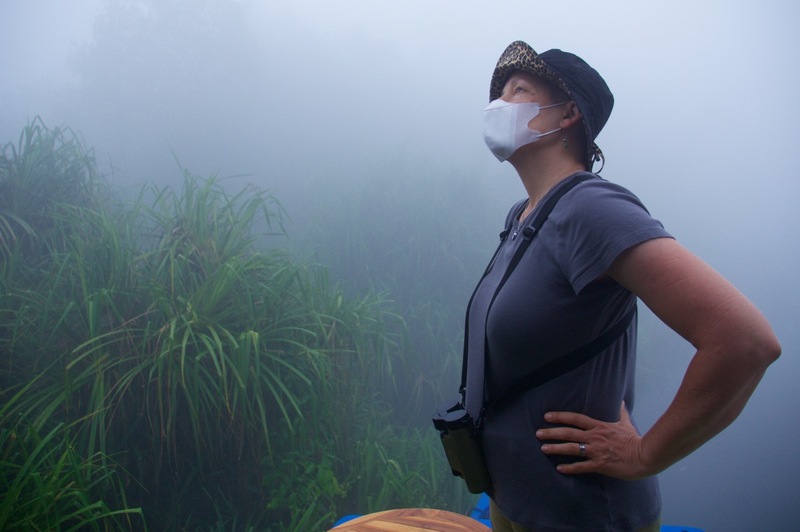 Beth and I spent two nights and the day in-between in Kumai. The day in-between, we did finally meet up with Siti, and she took us on a tour of some of the local sights. But I’ll tell you about that in a separate post. You may notice that the background of pretty much every photo is this blown-out bright gray. That’s what it really looked like. There was so much smog in the air that we didn’t see the moon or stars the whole time we were there. And the few times we saw the sun, it was just an orange ball that was so dim you could look directly at it. The smoke is a serious health problem for humans on this island and all around. It even caused an international incident, when Singapore declared a health emergency, canceled schools, and ordered civilians to wear masks or stay indoors. All this due to smoke blowing in from Indonesia. Why all the smoke? Farmers, both small scale and large, illegally burn off the native forest each year so they can plant more agriculture crops there instead, very often palm plantations. This is to make palm oil to export for the use in Oreos, margarine, and fortified milk (that’s where the “palm” comes from in “Vitamin A Palmitate”), among other things. Every year, the government decries this annual burning and then doesn’t do anything significant about it. When we were there, they were “considering cracking down” but that was only after the burning season was almost over anyhow (farmers rush to burn what they need to before the rainy season starts in late October). Indonesia’s government is largely corrupt, so it doesn’t take too many bribes by international food conglomerates to keep the government from taking real action. If you want to see the fires stop in a heartbeat, then make a law that the CEO of any company whose land “catches fire” goes to jail until the fire is extinguished. But as long as they can get away with it, it’s going to continue. The Wikipedia article on Borneo deforestation has some good info on the “burning season” problem. I was on one of “Siti’s” tours last week, and can recommend it with some reservations. 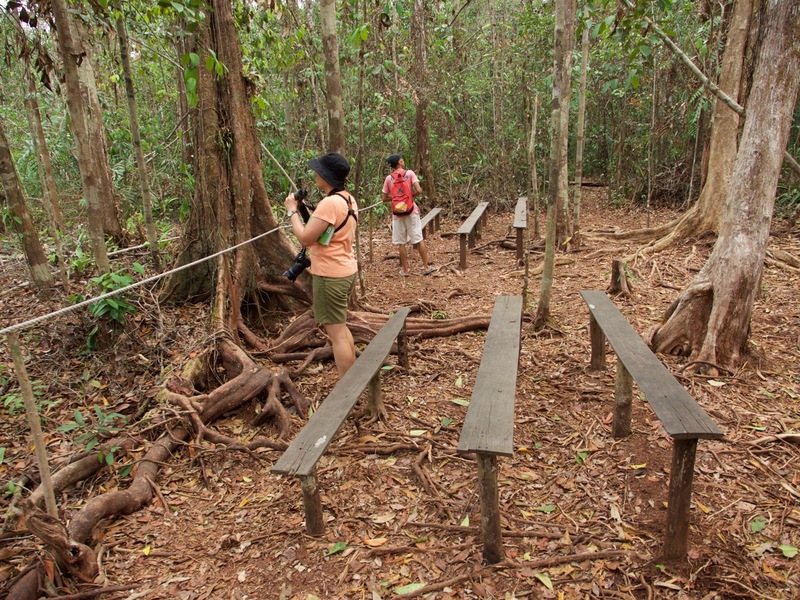 First, make sure you know what you’re getting into by signing up for one of these klotok tours of Tanjung Puting. The smoke is terrible, and breathing it 24 hours a day for several days will give you headaches and respiratory problems. It also reduces visibility greatly, which means that airline flights in and out will be delayed or canceled. But it also means that you won’t see the sun, moon, or stars the whole time you’re there. The sun appeared one day for us as a very weak orange disk, so dim you could look directly at it; the rest of the time it was invisible behind layers and layers of smoke. Also, the low visibility means that there will be days you can’t see birds or monkeys on the sides of the river because you literally can barely see the side of the river. The towns of Kumai and Pangkalan Bun are both very dusty and dirty. The airport is terrible, and runs out of food when passengers from one or two or three flights all get stuck there at the same time waiting for the smoke to clear enough so that airplanes and operate. Our flight was delayed 12 hours, and the only information anyone could get is “your plane is stuck on another island, so check back in 30 minutes”. Second, Siti doesn’t do all the tour guiding herself. In our case, even though all our communication with her was that she would be guiding us, we were surprised that someone else showed up at the airport to greet us, a different person met us at the dock to take us to the Rimba Ecolodge the night before our klotok trip, and a third person met us the next morning and guided the tour the next three days. We did eventually meet Siti after we returned from the national park, and she took us to supper the night we arrived back in Kumai. She is a wonderful, energetic, knowledgable person. But you should know that she may not personally be your tour guide. That’s important to know, since you will be paying a premium to go on one of her trips over a trip organized by someone else. Those two big caveats aside, the trip was a once-in-a-lifetime adventure. We saw orangutans every day, and not just at the scheduled feedings that the park rangers arrange (where tourists from several boats all gather). We saw several types of monkeys, gibbons, etc. 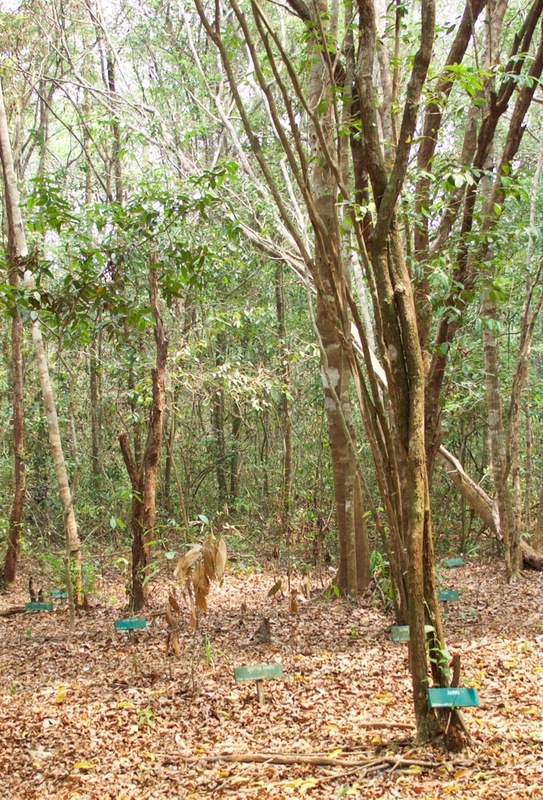 We saw tarantulas, several species of exotic birds, the native squirrel, wild pigs, a civet, and crocodiles. And the one-day tour around Pangkalan Bun the day after we returned was also good. We visited the sultan’s palace and the princess’ palace, took a trip on a motorized canoe up and down the river to see how the local fishing families live, toured Yayorin’s education office and homestay, and saw a traditional Dayak long house. What a fabulous story! I just returned from my own trip in tanjung puting and it is great to recognize so much in someone else’s story. I went with http://www.local-guides.org instead, and they were absolutely fantastic as well!